Family Info: Natalie was raised on a small farm in Byron, OK where they raised Hereford cattle and alfalfa. Her husband, Josh, is an Equine Dentist and trains colts as well. Josh and Natalie have one son, Grayson, who is the light of their lives! Pets: Max (Staffordshire Terrier), Bill (Border Collie/Kelpie), and the best cat ever, General Sterling Price! Personal Interests: Reading, traveling, and spending time with family. Education: DVM, Oklahoma State University Graduate of 2010. B.S. Biology/Animal Science, Northwestern Oklahoma State University, 2006. Burlington High School, Burlington, OK 2001. Dr. Keith is most proud of being selected by her peers and instructors to receive the “Gentle Doctor” award during her final year of vet school. Family Info: Tracy grew up in Grand Saline, TX (small town about 80 miles east of Dallas). Tracy has been married to his wife, Rainey, since 1998. They have 4 children: son Davian; son Justin; daughter Frost; and son Dally and 2 grandsons. They have been living in McLoud since 2007. Pets: Twix, Oreo, Bullet, and Rambo. Horses: Kitten, Spiderman, Little Jet, Auntie, Rocket, Cowboy, Susie, and Donkey. Professional Interests: Surgery, Equine Medicine. Education: DVM, Oklahoma State University 2004. Attended Northeast Texas Community College for 2 years on a rodeo scholarship. B.S. Commerce, Texas A&M, 1999. Grand Saline High School, 1993. Upon graduating vet school, Tracy joined the US Army Vet Corps and was stationed at Barksdale AFB in Bossier City, LA until June 2007. After 3 years in the service, he moved back to Oklahoma and worked at Shawnee Animal Hospital until March of 2011. Family Info: Mariah grew up in a small town outside of Wichita, KS before attending high school near Daytona Beach, FL. She returned to the central plains to attend the University of Oklahoma where she met her husband, Parker. She and Parker have been married since 2015. Education: DVM, Oklahoma State University 2018. MPH, Oklahoma State University 2018. B.S. Zoology, University of Oklahoma 2012. Family Info: Bethany was born and raised in Western Australia. She came to America to pursue her interest in cutting horses when she met her husband, Kirby, a horse trainer also in the cutting industry. 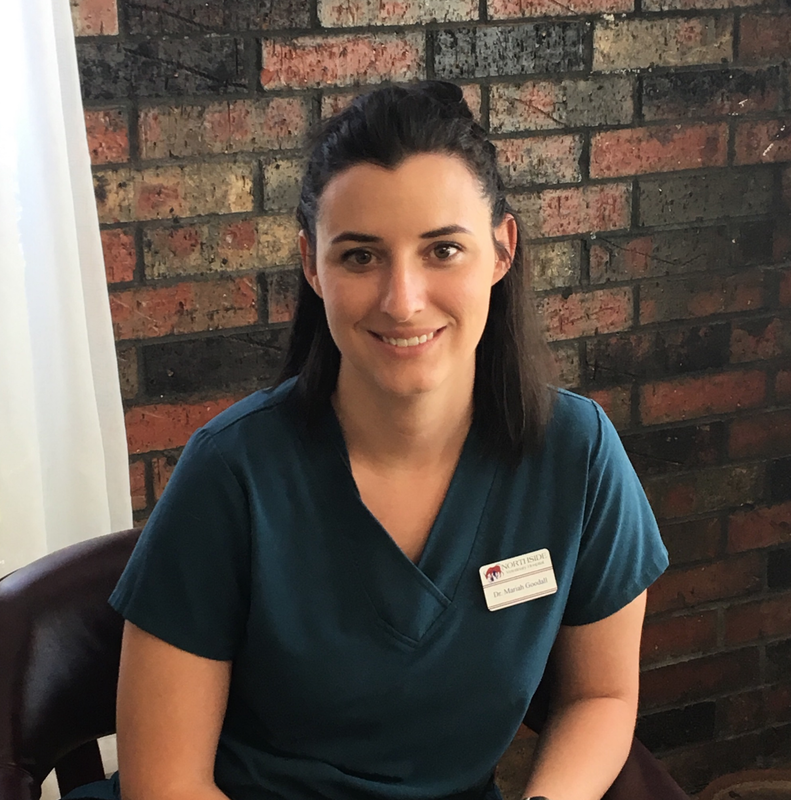 Bethany graduated as a registered veterinary nurse in Australia and has obtained a broad range of experience in both large and small animal care. Bethany, Kirby and their son Clancy currently reside in Seminole where they raise and train working Australian Kelpies. Family info: Shelly was born and raised right here in Shawnee, OK. She and her husband, Mike, have three beautiful children: Kelsee, Forrest, and Ethan. Professional Interests: Shelly’s favorites thing is to make people smile. Making people feel appreciated and welcome is her entire goal at Northside Veterinary Hospital. Hobbies: Reading, spending time with her family and crocheting. Graduated from Ada High School, then went onto study 2 years of accounting at ECU. Chris graduated from Murray State College as a registered Veterinary Technician in 1990. He worked for 2 years at OSU and a couple of other Veterinary Hospitals before joining Northside when we opened in 2011. Personal Interests: Traveling, time at the lake and spending time with family. Family info: Christina was raised in Asher, OK where her family raised cattle, cutting horses and every pet you can imagine. She now lives in Maud with her son Jett. Family Info: Josiah grew up in Shawnee, OK and graduated from Shawnee High School. He is currently attending OSU where he is studying Veterinary Science. Pets: Dudley (Dachshund), Hannah (Pointer Mix). Personal Interests: Spending time with family and traveling. Sarah grew up in Ponca City, OK where she also attended high school. She grew up with her German parents and learned to speak the language in her home. Her additional education includes the study of Psychology at the University of Oklahoma. Sarah has been interested in working with animals since she was very young. She has previously worked with marine animals, and has now ventured off into the world of four-legged creatures. Kelli was born in OKC and currently resides in Shawnee. 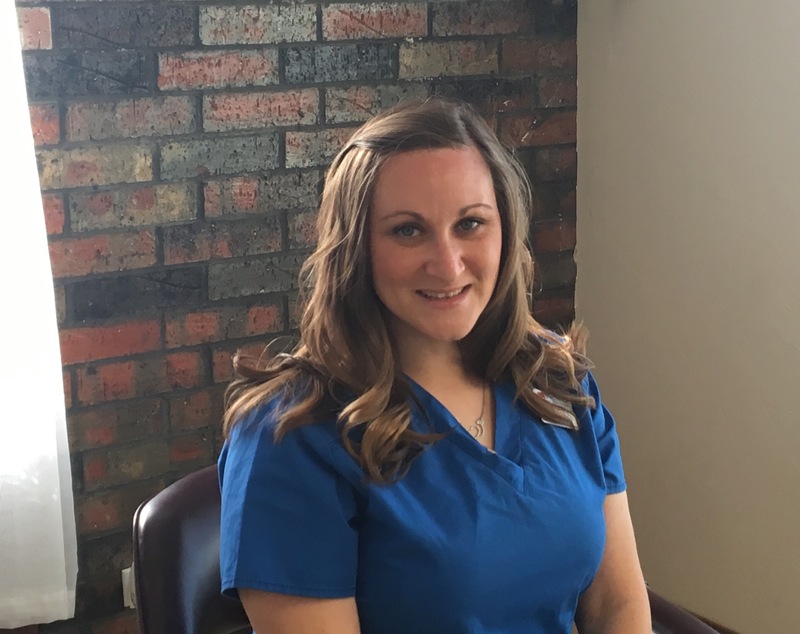 Kelli graduated from Macomb High School in 2010, attended Rose State College for 3 years and plans to become a Registered Veterinary Technician. Personal Interests: Spending time with family and pets, camping, travelling and working at NSVH. Pets: Missy (Chihuahua), Monroe (Staffordshire Terrier), Butters (Akita Mix), Lilly (Boxer mix) and 5 cats. Hailey was born and raised in Shawnee, OK, and graduated from Tecumseh High School in 2010. Hailey and her boyfriend have a son named Aiden. She plans on returning to school to become a Registered Veterinary Technician. Personal Interests: Taking care of animals, being a mom, camping and travelling. Danielle is a mother of 2 daughters, Lexi and Ember. 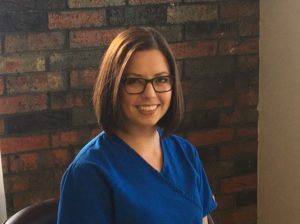 She graduated from Murray State College in 2013 as a Registered Veterinary Technician. Personal Interests: Barrel racing and horses. Heather is from Shawnee and is a mother to 2 sons David and Dylan, and daughter Kylie. Personal Interests: Watching movies with her children, working at NSVH, and working with animals and learning about their medical needs. Pets: Ozzy and Little Bit (Boston Terriers), Dexter (cat) and Luna (Bearded Dragon). Sandra was raised in Tucson, Arizona and moved to OK in 2007, where she graduated from Crooked Oak High school. Sandra attended graduated from the Veterinary Technician program at Heritage College in 2015. Personal Interests: fluent in Spanish, reading, cooking and baking. Pets: Fluffy, Lucky and Ivy (dogs) and Mr Kitty (cat). Nicki was born and raised in Oklahoma. She currently lives in Bethel with her wife Lauren and their daughter Jace. Pets: Nicki has 5 dogs. Two Staffordshire Terriers, a Long-Hair Chihuahua, Karma, a small mix breed, TJ, and a Shih Tzu, Justice. There are also several reptiles and a Quaker Parrot Bird. Personal Interests: Nicki enjoys spending time with family and her animals. She enjoys the outdoors and loves music. Jessica grew up in McLoud, Oklahoma before moving to Cincinnati, Ohio. She resided there for 10 years and then moved back to Shawnee in 2010 to be closer to family. She started training in grooming and hasn’t stopped since! Jessica has one son, Jakob, to help keep her busy. Pets: Sparxx, a Rottweiler, and two cats: Momma Kitty & Baby Kitty. Personal Interests: outdoor activities, music, and spending time with family. Kristie is a mother to 3 daughters whom she loves very much. She loves her job and learning new things about animals. Personal Interests: Riding four wheelers, camping and fishing. Lacey is from Meeker, Oklahoma. She is working on acquiring her Registered Veterinary Technician License. Lacey has a son named Brodey who loves to rodeo and play baseball. Lacey loves being able to watch him participate in these sporting events. Lacey and Brodey have a blue heeler named Zip and a beagle named Jackey. Chelsea recently moved to Shawnee from Sarasota, FL to help with her family’s Vineyard and winery. 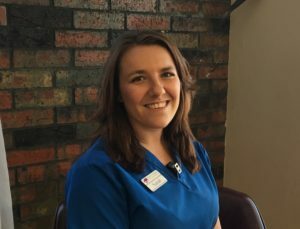 She is pursuing her veterinary technician certification at OSU-OKC and recently returned to school to pursue her goal of becoming a Veterinarian. Personal Interests: Chelsea enjoys competing in 3-day events on her horse Titan and playing Frisbee with her Bull Terrier, Dali. Autumn was raised in Tecumseh, OK and graduated from Tecumseh high school in 2012. Autumn currently resides in Shawnee with her fiancé and their son “Boston”. Personal Interests: Spending time with family and being a mother. Rebecca grew up in Seminole, OK and now lives with her husband Taylor in Wewoka, OK. She recently graduated from ECU in Ada with her Bachelor’s degree in Business Management. Personal Interests: Include gardening, reading and spending time with her pets. Pets: 5 rescue dogs, 3 cats and 2 parakeets. Destiny was raised on a farm in Seminole, OK and was an active member of the FFA for 5 years. The best decision that Destiny has ever made is to marry her best friend Jacob. They now reside in Shawnee, OK. Personal interests: Destiny enjoys watching movies, working with animals and spending time with friends and family. Pets: Patch, Samson and Browning.